We had managed to get the hang of this sailing flotilla lark, had a brief rest at Frikes and all ready for the second week of adventures. 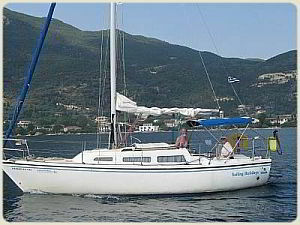 We had visited Sivota on Lefkas, Little Vathy on Meganisi, Port Vathi and Frikes on Ithaka and Sami and Ag. Ephemia on Kefalonia. On the way we had developed some (over?) confidence in our sailing ability and we were having a wonderful time. Now it is time to move on to the second week. In case you missed week 1 you can use these links to go directly to a day. From Frikes we sailed back to Meganisi. Here the sailing flotilla lead crew did their sales pitch for the t-shirts and fleeces. I bought a vest which had the words 'Another Day Another Bay' printed on it. That really sums up the holiday well. It was also here that we encountered the somewhat more formal approach of other sailing flotilla companies where everyone had to call in on the radio to get permission to do anything at all. Even then they caused chaos by sailing round in circles in the harbour. 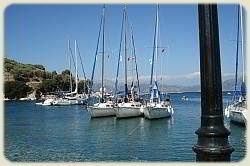 Were we glad we chose Sailing Holidays? Next stop Kastos harbour. For the technically minded we were rafted up on longs lines to shore. Sounds fancy doesn't it? The harbour was so clean it was great for a refreshing dip. The lead crew arranged a beach drinks party (what do they put in the fruit punch?) after which we went up to the Windmill taverna which has panoramic views all around. Another great evening. This morning we heard bad news (well for us anyway). It was to be a free sailing day. In other words we could go where we wanted. The trouble was we had become very used to the security of knowing that the lead crew would always be there at the end of the day to guide us in, but this time they wouldn't !! So along with a few other like minded fellow crews we all decided to take the easy option of going directly to the nearest harbour in order to be assured of an easy berth. The harbour was Kalamos. 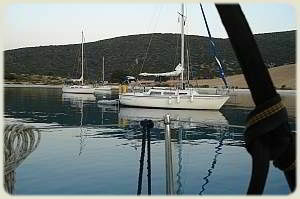 We were the first to arrive and in fact there was no problem as the local taverna owner was used to incompetent sailing flotilla sailors and he helped us in. The problem was that we dropped the kedge anchor too early and we ran out of rope. 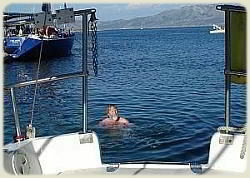 The only thing was to get in the dinghy and pull my self along the anchor rope, lift the anchor and then drop it closer to the yacht. That worked well except that when I let go of the anchor and prepared to return to Kassos I realised that I had forgotten to take the oars with me. So there I was drifting around in the harbour wanting to get back on board to have the traditional arrival beer. Its amazing how you can propel a dinghy with bare hands !! We had great fun pretending to be the lead crew by guiding in the later arrivals of our fellow sailing flotilla crews on the VHF radio. After the free sail day we were heading for a bay on the mainland to join up with the rest of the sailing flotilla. It was pretty windless and so a lot of motoring was involved. At lunch time we just drifted as usual, well not in the true meaning of the word as it was a flat calm and we didn't move. 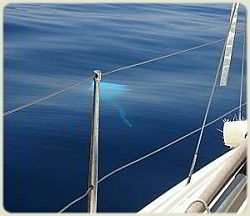 The big excitement was while we were having our beer and peaches we spotted a huge blue and white beast swimming round the yacht. It was a Manta Ray checking us out. By the time I got the camera out the best picture was gone as you can see. But you can get the idea. The bay again was very calm. James intended to raft us all together with lines to the shore. But we got into bother with the local constabulary who said that our anchors were a health and safety problem. In Greece ??? The more cynical amongst us suggested that our company did not pay any 'fees' unlike others. So we ended up just swinging on the anchor. It was a most peaceful night and beautiful dawn. This was not our most favourite spot. After all the peace and tranquility of the island harbours it was a bit of a shock to be at a busy town easily accessible by road from the mainland. I suppose we were just getting spoilt. However back to our starting point. 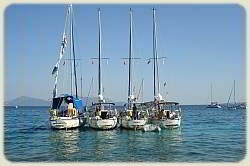 Sivota is fairly busy but almost totally due to the yachting activities so by now we felt really at home. 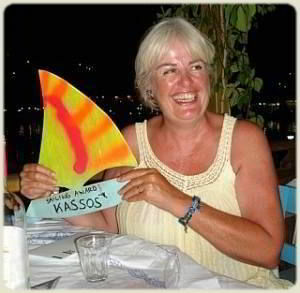 The main task was to pack up ready for the return home next day and get Kassos a bit cleaned up for her next guests. We later learned that you don't need to be too fussy, let alone mopping out the bilges with a sponge, as there is a team of cleaners who swarm over the boats getting them ship shape again. It is also a time for Sailing Holidays maintenance crew to sort out the things that went wrong and broke whilst under the skippership of a bunch of amateurs. The end of the holiday was marked by a group meal in the taverna of the brilliant tzatziki. Much merriment was had, especially during the award ceremony at the end when every crew was given some appropriate token related to their adventures during the fortnight. 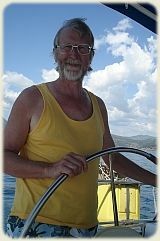 We were really chuffed when James said that of all the sailing flotillas he had led this was the first one where one crew who knew nothing about sailing, survived the entire trip without mishap or getting lost. That was US!! He couldn't believe that we had never done it before and as a result we won the prestigious Sailing Award. So that was it. Back on the coach to Aktion Airport at Preveza. A few stops were required for some of the other crews who had maybe over indulged at the award ceremony. Good tip - don't drink too much the night before a coach ride in Greece. The queue at the check-in was standard package holiday horrendous, but by then we had plenty of friends to chat to. Many great memories and a genuine intention to do it again, but with more crew next time!